Hikers enjoying the view on the Pfälzer Weinsteig trail near Burg Trifels castle. Signpost on the Pfälzer Weinsteig trail. Wooden hut on the Pfälzer Weinsteig trail. Walking tour on the Kalmit mountain, Pfälzer Weinsteig hiking trail. Walkers on the Pfälzer Weinsteig trail near Leinsweiler. Pfälzer Weinsteig trail: Hikers at the Burg Landeck castle. Dionysian delights and untouched, deep forests - these are the greatest highlights on offer on your hike along the Pfälzer Weinsteig trail. The Pfälzer Weinsteig trail begins at the castle ruins Neuleiningen, and ends after 170 kilometres in Schweigen-Rechtenbahn, making it the longest of the Palatine trails. The over 12,000 altitude metres to overcome in ascents and descents also makes it the most challenging of the regional trails. The route along the edge of the Haardt Mountains is dotted with ancient ruins of fortresses and gem-like wine villages, and offers spectacular views of the Rhine Valley region. The true charm of the trail lies in the alternating legs along sleepy forest paths and across the sun-drenched slopes of the wine country. The Pfälzer Weinsteig trail is pure Palatinate: the 170 kilometre long trail follows picturesque paths through pleasant forest and sun-drenched stages to the Rebenmeer, which is one of the largest wine-growing areas in the Palatinate. The tour starts at the architecturally striking House of the German Wine Route, the geographical start of the oldest tourist route in Germany. 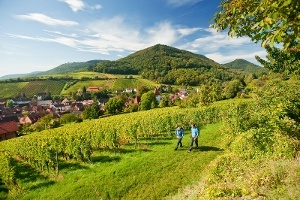 You quickly leave the built-up area behind and dip into the sunny sea of Palatinate vineyards. Via sunny grass paths, the route rises gently towards Fahrenberg and reaches Heiligenkirche, a beautiful hermitage under a shady forest grove. Once you have passed the sacrificial stone (Opferstein), the route goes to Patriciawingert where you can enjoy a view of the Rhine plateau and on to Odenwald for a short break at the panorama bar. Continuing through the vineyards, the route rises steeply towards Galgenberg for a short time. At Wolfskehl we reach a small high-level plateau and briefly hike through the open fields. The route quickly branches off down the slope to the Asselheim wine hiking hut (opening times via the link below). Once you've gained your second wind, it’s now uphill to Gerstenberg, with a fantastic view of Donnersberg. The refined plutonite appears to only be a stone's throw away. If the weather is favourable you can watch the soundless gliders take off and land or perhaps make a 500 metre detour off route to the Quirnheim motorbike museum (opening times via the link below). The route now goes downhill again towards Mertesheim. During the descent, we enjoy a view of the fields and vineyards on the opposite slope. If you look closely you can see the remains of a cable car to the right that was used to transport iron ore to Mertesheim station in the past. In the beautifully decorated centre of Mertesheim there are rail links, shopping and accommodation options. Leaving the town to the east, we follow the Eisbach stream and reach the shady Grünstadt Town Park where you can also take a break (opening times below). Further towards the west we leave the Town Park and enjoy another spectacular view of Donnersberg from Grünstadter Berg. Further towards the south through the vineyards, after a short time we reach the mountain village of Neuleiningen where you can also pause or stay overnight. From the historic walls of the ruins of Neuleiningen Castle and the parish church of St Nikolaus. Following the cobbled streets and stairways, lined with pretty timber-framed houses, we leave the town and walk down into the Neuleiningen Valley. Passing through sunny vineyards and a shady rest spot under a cherry tree, we eventually arrive at the small village of Battenberg. It is worth visiting the ruins of Battenberg Castle, with a lovely view across the Rhine plain, or taking the path to the 'Blitzröhren', an interesting geological feature. We then walk past the last houses at the edge of the village and into the forest. The next few kilometres of the trail follow shady, gentle forest paths until it reaches the Lindemannsruhe foresters' lodge and restaurant. From here, it's not far to the imposing, 40m high Bismarck Tower on the Peterskopf hill. Passing the Geier springs, we follow the forest paths downwards before a short ascent brings us to an old Germanic ritual site on the Teufelsstein mountain (Devil's Stone) with a large boulder on top of it, which carries the same name as the mountain. According to legend, the holes in the stone were made by the furious devil himself. Shortly after this we find a ring fort in the forest, the so-called Heidenmauer (Heathen Wall), which was built by the Celts in around 500 B.C. Passing the Kaiser Wilhelm monument, with its magnificent view of the ruins of Limburg Abbey, the trail continues to the 'Kriemhildenstuhl', the best preserved Roman quarry north of the Alps, with its ancient inscriptions. The fantastic view from the 100m x 200m rock platform reaches from the Rebenmeer wine-growing area and the Rhine plain to the Odenwald mountain range and the Black Forest. After a quick stop at another viewing point, the trail takes us down into the attractive spa town of Bad Dürkheim, with the largest wine barrel in the world and the second longest graduation tower in Germany. From Römerplatz square we walk through Bad Dürkheim to the Flaggenturm Tower, which offers a panoramic view of the Rebenmeer wine-growing area, the Rhine plain and the Palatinate Forest. It's worth taking the short detour to the abbey and to the exclusive district of Seebach. The trail continues through chestnut trees and later through the heat-loving pine and oak forests down to a shady picnic spot by the river. We continue on the path over a wooded ridge, before reaching the idyllic Burg Valley. The trail goes past the campsite to the ruins of Wachten Castle, the 'Palatinate's balcony'. Here we can not only have something to eat and drink in the castle restaurant, but also enjoy the magnificent view of the town of Wachenheim, known for its wine and sparkling wine, and the Rhine plain. We then return to the woods and follow the slope upwards for some time before reaching a stone gate that marks the entrance of the Heidenlöcher (Heathen Holes), the remains of a stronghold dating from the Carolingian era. At the other side of the ruins, a steep path brings us down to the Michael Chapel, with its view towards the east of Deidesheim and its vineyards. Walking through sun-drenched vineyards, we finally reach our destination of Deidesheim. This climactic spa town will surely impress you with its own characteristic wine bars and wineries, as well as its romantic historical town centre. From the historical market square in Deidesheim we first walk past the open air swimming bath and through sunny vineyards along the River Weinbach, before entering the forest at the Pfalzblick restaurant. The shady path brings us to the former Schlossberg vineyard, past the Klausen Chapel and on to the wine-producing village of Königsbach, with its pretty parish church of St Johannes. After the ascent to the 'Meerspinnblick' shelter above Gimmeldingen, we walk along the babbling Mußbach through the Gimmeldingen Valley to the Benjental foresters' lodge. The long ascent up the 554m Weinbiet begins here and brings us through pretty woods to the highest peak of the Haardt Hills north of the River Speyerbach. We can reward ourselves with something to eat at the Weinbiethaus (run by PWV, a local association) before making the final ascent to the viewing tower. The view from the top of the tower stretches across the Rhine plain and as far as the highest summits of the Palatinate Forest. The trail carries on over the crest of the Wolfsberg and down past the Bergstein natural monument and across the Hohfelsen rock to the ruins of Wolfsburg Castle, whose small restaurant is open on the weekends. An easy path along the slope then brings us to the Scheffelwarte viewing point, where the descent to Neustadt an der Weinstraße begins. Passing both the Deidesheim Temple and the Dr Welsch Terrace, we take the Haardt steps down to the historical old town and let the hustle and bustle of the town and the charming timber-framed houses enchant us. We start in the lively market square in Neustadt, making our way through the pedestrian zone and eventually beginning the ascent to the Nollensattel. From here, we follow an easy path on the slope through the chestnut trees, before a path begins the steep ascent past moss-covered rocks in the forest to the Zigeunerfelsen rock. The path continues upwards to the 490m high Nollenkopf and along the ridge past the Speierheld hikers' hut to the Hambacher Bergstein natural monument. From here, we hike on pretty paths to the stone cross and then towards Hambach Castle, which is always worth a visit. We walk clockwise around the Sommerberg mountain to reach the Hohe-Loog-Haus (PWV) restaurant where we can enjoy a meal and the view from the terrace over the southern Palatinate, stretching as far as Kraichgau and the Black Forest. Refreshed and ready to continue, we make the gradual ascent to the Kalmit mountain. At the top of the highest peak in the Palatinate, we can enjoy fantastic views of the Rhine plain 500m below and, on Wednesdays and weekends, the hospitality of the Ludwigshafen hikers' hut (PWV). South west of the Kalmit, on the Hüttenberg mountain, lies another highlight of our route – the imposing block field. From here, the trail leads us through the charming pine forests down to the Totenkopfstraße on the eastern edge of St. Martin, picturesquely situated at the end of the Kropsbach Valley. Passing the Bellachini lake, it's not far to the idyllic, protected historical town centre. The fifth stage of the trail begins in the historical town centre of St. Martin. We begin by walking to the western end of the town, where we pass the Bellachini fountain, then through the woods to the Schalbenfelsen rock and on to the Dichterhain monument commemorating three local poets. We then walk up a gentle slope to bring us to the St Ottilia Chapel and continue through forests where you can pick some wild blueberries, and down to the Edenkoben Valley. An educational trail brings us along the crystal clear, rippling river to the idyllic Hilschweiher lake and waterfall. Another ascent through the shady forest brings us past the Rietburg chair lift to Villa Ludwigshöhe, the former summer residence of King Louis I of Bavaria. Above the sun-drenched vineyards we reach the Virgin Mary grotto, built by Weyher in 1904, and continue on to the Buschmühle restaurant in the Modenbach Valley. The ascent to the St Anna hikers' hut (PWV) begins here on easy forest paths. The hut is open on Wednesdays and weekends for hungry and thirsty hikers. Beside the hut, the St Anna Chapel sits on an offshoot of the Teufelsberg mountain and looks over Burrweiler. The view from the chapel is just as impressive as its location. A crossroads brings us down to the wine-producing village of Burrweiler, the final destination of today's hike. From Burrweiler, we take the crossroads which we passed on the previous day and return to the St Anna hikers' hut (PWV). The trail then continues along the slope of the Teufelsberg mountain to the Trifelsblick hikers' hut (PWV), which lies at 550m. Here we can enjoy the wonderful view from the terrace, which also gives the hut its name. The view reaches from Trifels Castle to the Wasgau mountain range and to the Vosges. Easy paths bring us through pretty forests along the Teufelsberg and Roßberg mountains to the next rest stop, the Ramberger Waldhaus (PWV), where we can pause for a snack or a piece of cake to give us strength for the rest of our hike. The attractive forest path eventually brings us to the imposing ruins of Neuscharfeneck Castle, which was destroyed during the Thirty Years' War. From the castle it's not far to the Landauer hikers' hut (PWV) in its idyllic woodland setting, where there are plenty of places to sit outside in the shade. We can also satisfy our hunger and quench our thirst here before taking on the circuit around the Orensberg mountain. The unparalleled 270° panorama from the large platform of the Orensfelsen rock is worth the effort of the ascent. We then descend past the Landauer hut (PWV) and the Dernbacher Haus restaurant, with its great views, to the small village of Dernbach. The seventh stage of the Weinsteig trail begins in the attractive village of Dernbach, nestled among the hills. From here, we climb uphill in the forest and arrive at the Eußerthal sanatorium. Easy forest paths bring us along the slopes of the Walterskopf mountain to the municipality of Eußerthal, with its parish church, site of a former Cistercian monastery. The trail continues through pretty orchards past a stone wayside cross and up into the forest once again. On the sometimes steep climb up the pass between the Grüneck and Franzosenkopf mountains the clear, cold water of the Eselstränke springs quench our thirst. On the descent to Gräfenhausen the 3-castle-view rest area invites us to pause for a moment. Across from us, Trifels Castle and the ruined castles of Anebos and Scharfenberg rise up into the Palatinate sky. We walk through the small wine-producing village of Gräfenhausen and, after a long ascent on shady trails and paths, reach the Jungpfalz shelter and the Holderquelle fountain on the northern slope of the Großer Adelsberg mountain. It's worth making the short detour (approx. 500m) to the Jungpfalz hikers' hut, which is open at the weekends. It's also not far from here to the Krappenfels viewing point, where you will be greeted by a lovely view of Trifels Castle. A path brings us down the wooded slope to the Turnerheim restaurant and on towards Annweiler. In this small town on the River Queich and at the foot of Trifels Castle, a historical town centre with a watermill, tanners' quarter and romantic alleyways awaits us. From the spa gardens in Annweiler we walk uphill on shady paths through the chestnut trees to Trifels Castle car park. The former imperial castle on the 494m high Sonnenberg mountain, with its imperial regalia, is worth a detour. Passing the Barbarossa restaurant, the trail continues below the ruins of Anebos Castle towards a pass, flanked on both sides by imposing sandstone rocks. These partially weathered massifs rise like cliffs from the forest floor and make for an impressive backdrop. Especially at weekends, we can see climbers practising their sport here. An attractive path now takes us below the rocks to the ruins of Scharfenberg Castle. After a short, steep descent we walk along the wooded southern slopes of the Föhrlenberg mountain and finally up a path through chestnut trees to the ruins of Neukastell. We can climb a steep ladder to a viewing platform, which offers a magnificent view of the ruins of Madenburg Castle. Passing Slevogthof, the long-term residence and studio of the famous Impressionist Max Slevogt, we then descend to the small village of Leinsweiler, where we can refresh our feet in the roadside wading pool. We then continue on the gentle uphill trail through sun-drenched vineyards and shady woods to the ruins of Madenburg Castle, one of the largest and oldest castles in the Palatinate. The castle restaurant invites us to pause for a meal in a historical atmosphere. The trail continues on a narrow path down to the Kaiserbach Valley, past the Palatinate Clinic to the ruins of Landeck Castle. Here we also find a castle restaurant with a magnificent view of the Rhine plain. Now only one final descent separates us from the end destination of our hike, the charming wine-producing town of Klingenmünster. We begin at the abbey in Klingenmünster and walk through the park along the River Klingbach, before ascending through sun-drenched vineyards to the village of Gleiszellen. The trail continues through the alleys of this picturesque village. Just after the Hatzelberg fountain, we enter the forest and walk along the slopes of the Hatzelberg and Röhlberg hills to the crossroads at ‘Am Seicheneck’. Finally, we descend through the trees into a small valley, which we then follow downhill into a larger valley. A gentle path along the floodplain brings us past a tennis court to a wonderful, historical timbered house which houses the Wappenschmiede restaurant in Pleisweiler, where we can stop and refresh ourselves. Leaving Pleisweiler behind us, we walk through beautiful vineyards, past a vine-covered hikers' shelter, to the spa town of Bad Bergzabern. Stroll around the winding streets of the historical town centre and relax in the idyllic park and the South Palatinate thermal springs. The magnificent castle and the 'Zum Engel' restaurant, a splendid building dating from the Renaissance, are also well worth a visit. The last stage of our hike begins in the market square in Bad Bergzabern. After a gentle stroll through the town spa park we pass the Böhämmerhaus restaurant, which is open on Sundays, and walk into the vineyards. We continue past a hikers' shelter in the forest and along the meadow to reach Dörrenbach, one of the prettiest villages on the German Wine Route. Picturesque timber-framed houses and quaint wine taverns invite us to pause here. We pass the 400-year-old Renaissance-style town hall and the historical fortified church and walk uphill through the forest to Kolmerberg Chapel, one of the most beloved pilgrimage churches of the South Palatinate. Shady paths continue up to the viewing point on the Stäffelsberg mountain. Finally we walk down through the woods, follow the Westwall path on the southern slope of the Farrenberg mountain and reach the ruins of Guttenberg Castle on the Schlossberg mountain. The long descent begins behind the ruins, passing a waymarker with a hikers' shelter and continues to the charmingly situated Landschaftsweiher lake in the Breitenborn Valley. Now only one beautiful section of the trail through sun-drenched vineyards separates us from the end destination of our hike, the famous German Wine Gate in Schweigen-Rechtenbach. Standing in front of the 18m high landmark of the German Wine Route, we have finally achieved our goal and can look back on a day full of great experiences on the Pfälzer Weinsteig trail. For description getting there by car please take o look on the single legs. Train stations are availalbe at the following towns and villages: Bockenheim, Bad Dürkheim Wachenheim, Deidesheim, Neustadt, Maikammer/Kirrweiler, Edenkoben, Bad Bergzabern, Wissembourg. All other destinations along the Pfälzer Weinsteig are well connected by bus (even on the weekends). Overview: Accommodations providing hiker-friendly facilities & services at the Pfälzer Weinsteig.